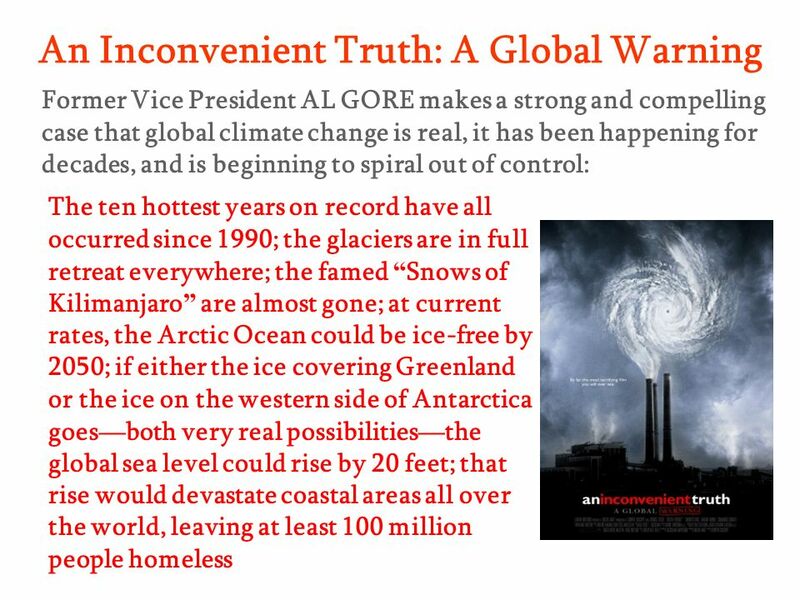 Inconvenient Truths and Convenient Lies: the Global Climate Change Issue By Cynthia McMeans (and primarily from Al Gore’s An Inconvenient Truth: A Global. 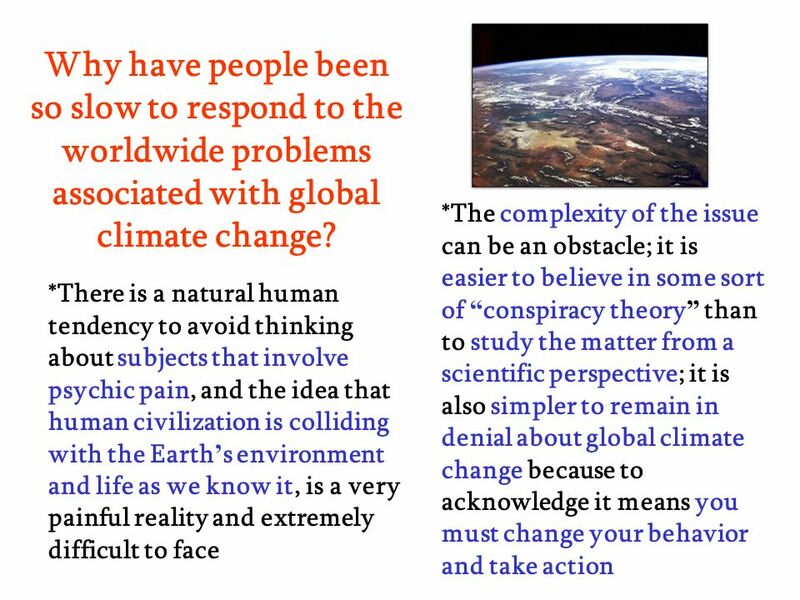 3 What is Global Warming? 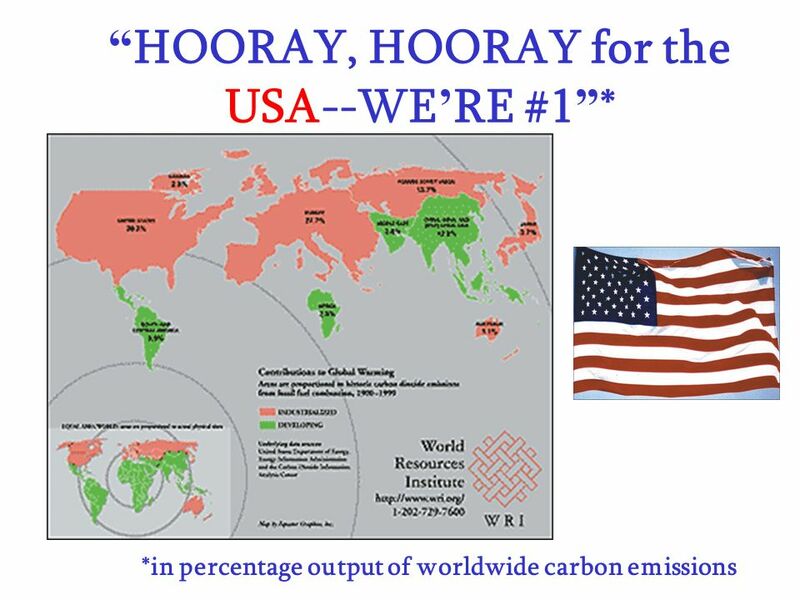 Carbon dioxide and other gases warm the surface of the planet naturally by trapping atmospheric solar heat, keeping the Earth habitable; but when we burn fossil fuels such as coal, gas, and oil and clear forests, we dramatically increase the amount of carbon dioxide in the atmosphere and temperatures rise quickly. 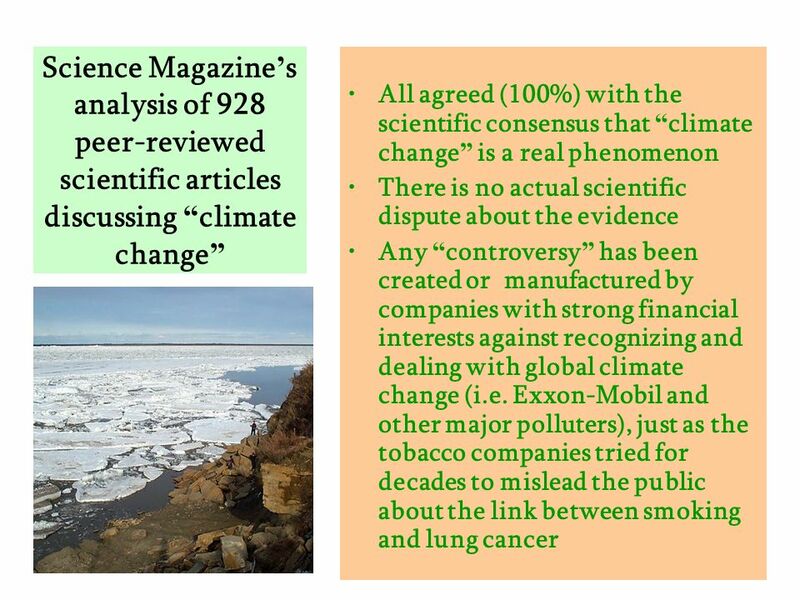 The vast majority of scientists agree that global warming is real, it is already happening, and that it is the result of human activities, and not some natural occurrence. The scientific evidence is now overwhelming and undeniable. 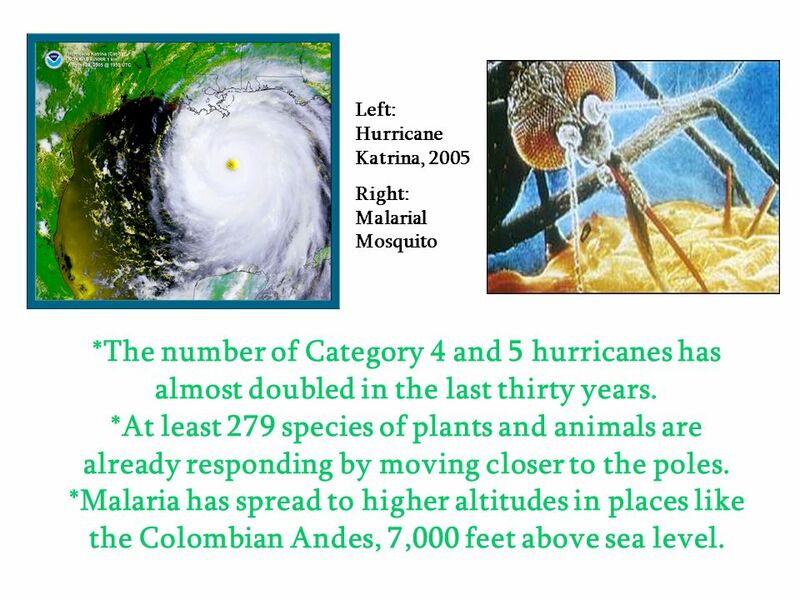 Right: Malarial Mosquito *The number of Category 4 and 5 hurricanes has almost doubled in the last thirty years. 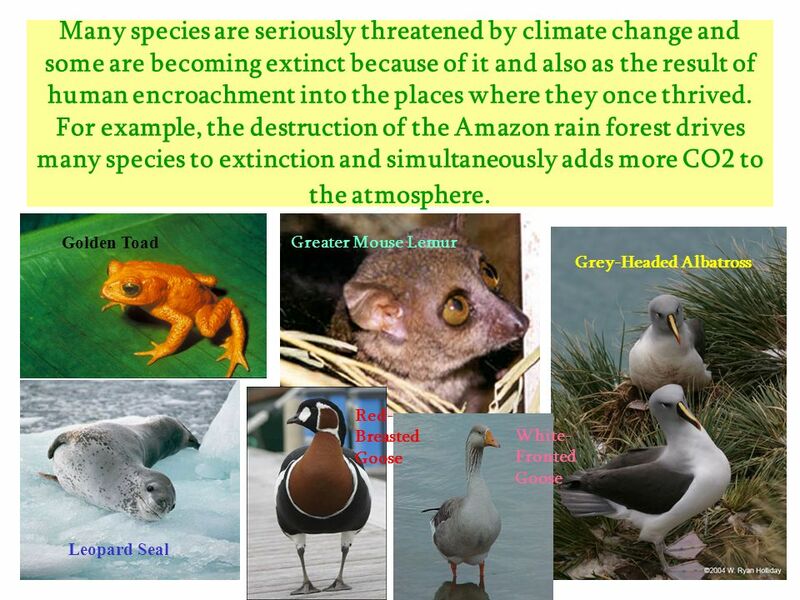 *At least 279 species of plants and animals are already responding by moving closer to the poles. 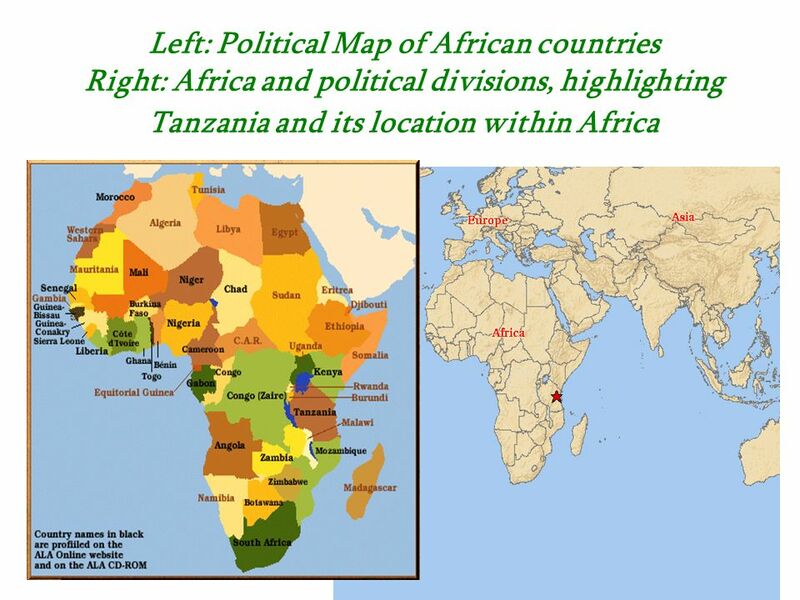 *Malaria has spread to higher altitudes in places like the Colombian Andes, 7,000 feet above sea level. 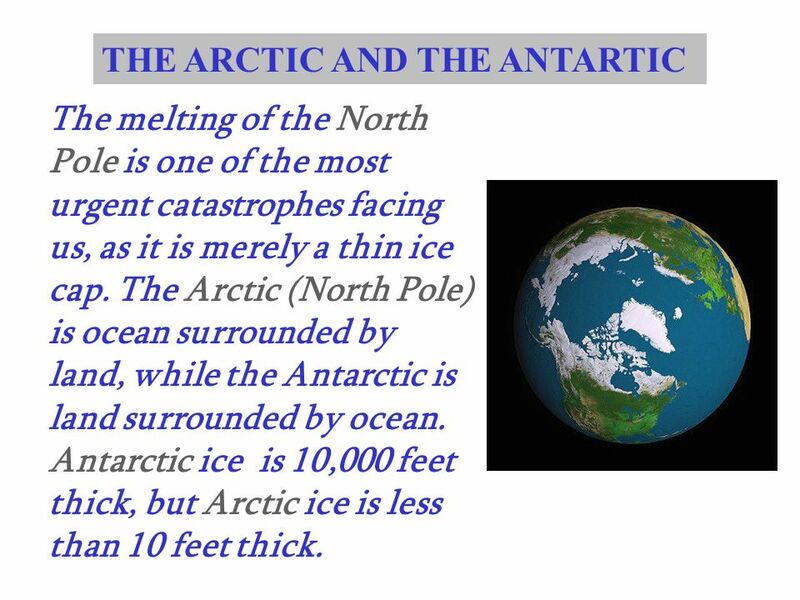 The melting of the North Pole is one of the most urgent catastrophes facing us, as it is merely a thin ice cap. The Arctic (North Pole) is ocean surrounded by land, while the Antarctic is land surrounded by ocean. Antarctic ice is 10,000 feet thick, but Arctic ice is less than 10 feet thick. 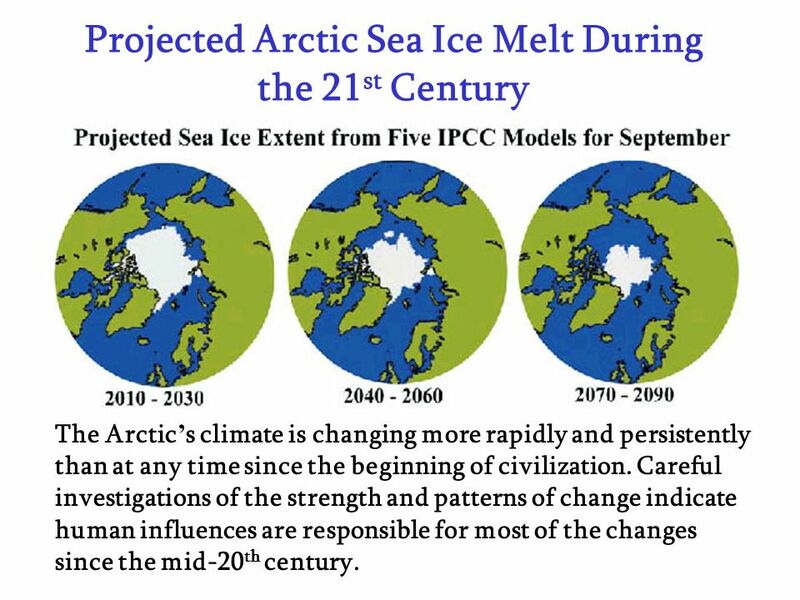 9 ARCTIC AND ANTARTIC We have lost 40% of the Arctic mass in the last 40 years; and as this ice melts, a dramatic change occurs in the relationship of the Earth’s surface to the Sun. 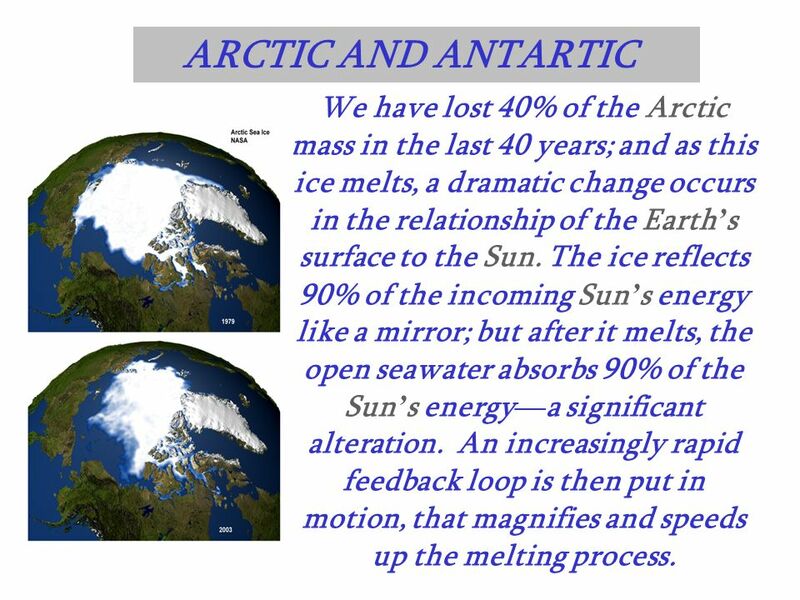 The ice reflects 90% of the incoming Sun’s energy like a mirror; but after it melts, the open seawater absorbs 90% of the Sun’s energy—a significant alteration. An increasingly rapid feedback loop is then put in motion, that magnifies and speeds up the melting process. The Greenland Ice Sheet dominates land ice in the Arctic. 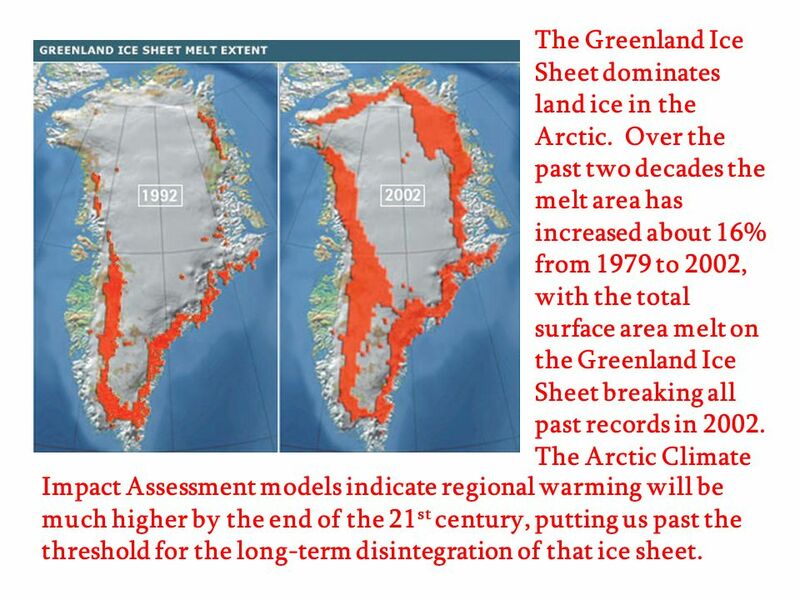 Over the past two decades the melt area has increased about 16% from 1979 to 2002, with the total surface area melt on the Greenland Ice Sheet breaking all past records in The Arctic Climate Impact Assessment models indicate regional warming will be much higher by the end of the 21st century, putting us past the threshold for the long-term disintegration of that ice sheet. 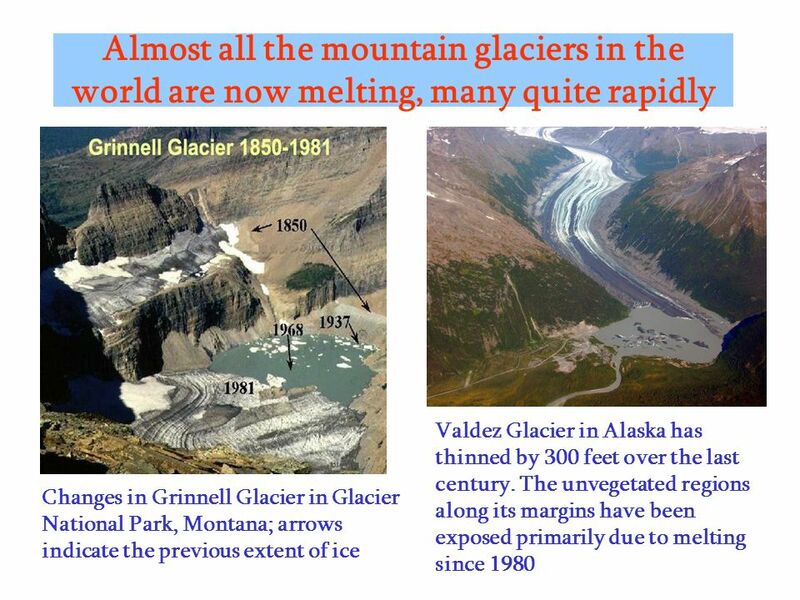 The Arctic’s climate is changing more rapidly and persistently than at any time since the beginning of civilization. 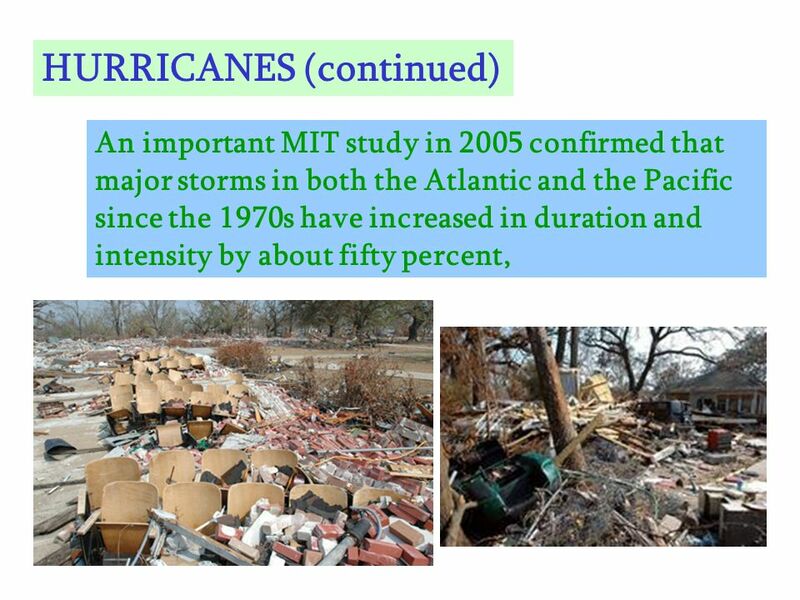 Careful investigations of the strength and patterns of change indicate human influences are responsible for most of the changes since the mid-20th century. March 7, 2002 Disappearing sea ice and warmer temperatures around the Antarctic Peninsula are causing an 80% drop in the numbers of Krill, leading to a devastating food chain crash. This affects fish, penguins, sea birds, whales, and other animals, as well as the commercial fishing industry. 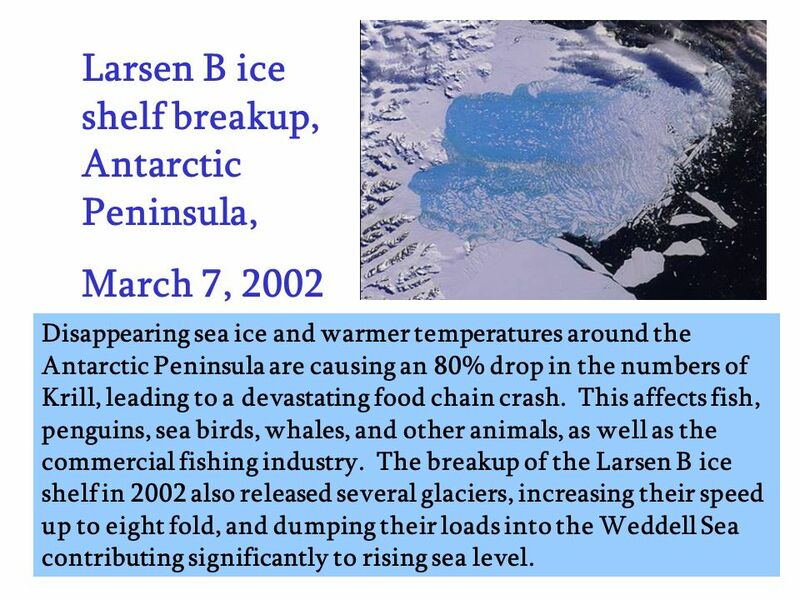 The breakup of the Larsen B ice shelf in 2002 also released several glaciers, increasing their speed up to eight fold, and dumping their loads into the Weddell Sea contributing significantly to rising sea level. 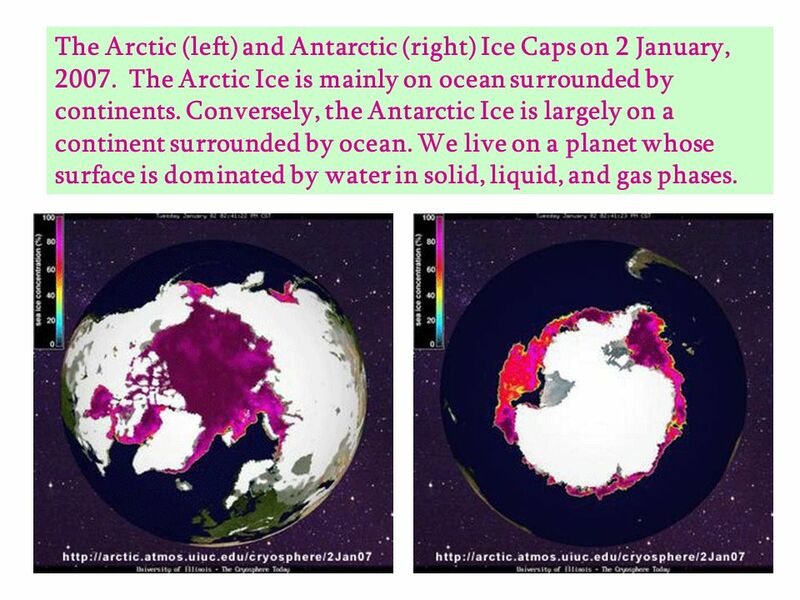 The Arctic (left) and Antarctic (right) Ice Caps on 2 January, The Arctic Ice is mainly on ocean surrounded by continents. 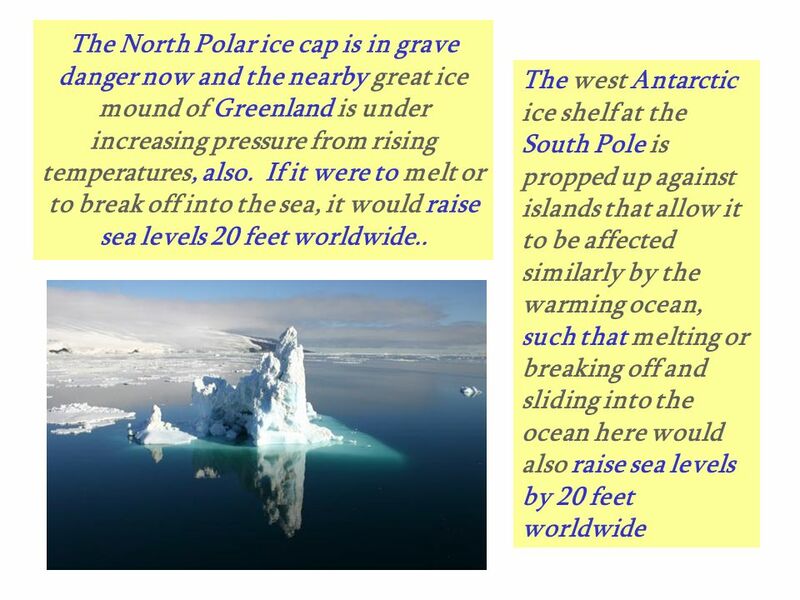 Conversely, the Antarctic Ice is largely on a continent surrounded by ocean. We live on a planet whose surface is dominated by water in solid, liquid, and gas phases. 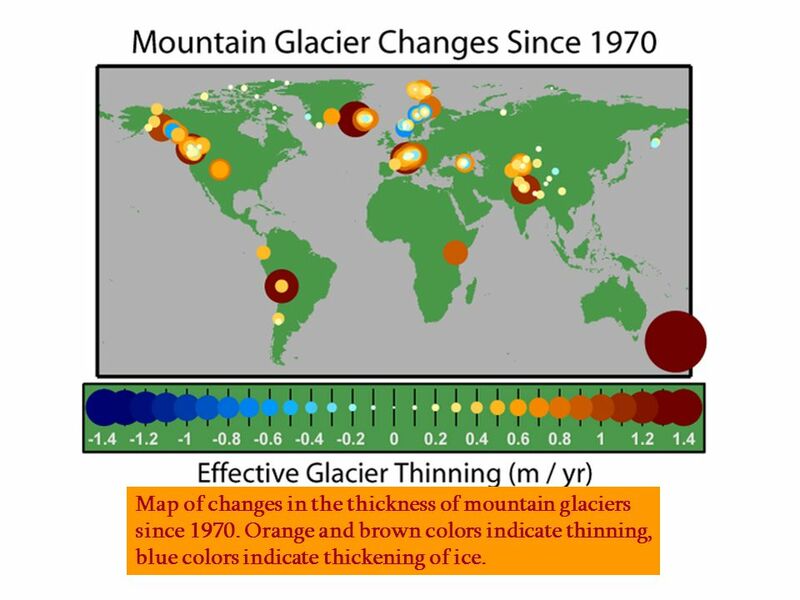 Map of changes in the thickness of mountain glaciers since Orange and brown colors indicate thinning, blue colors indicate thickening of ice. 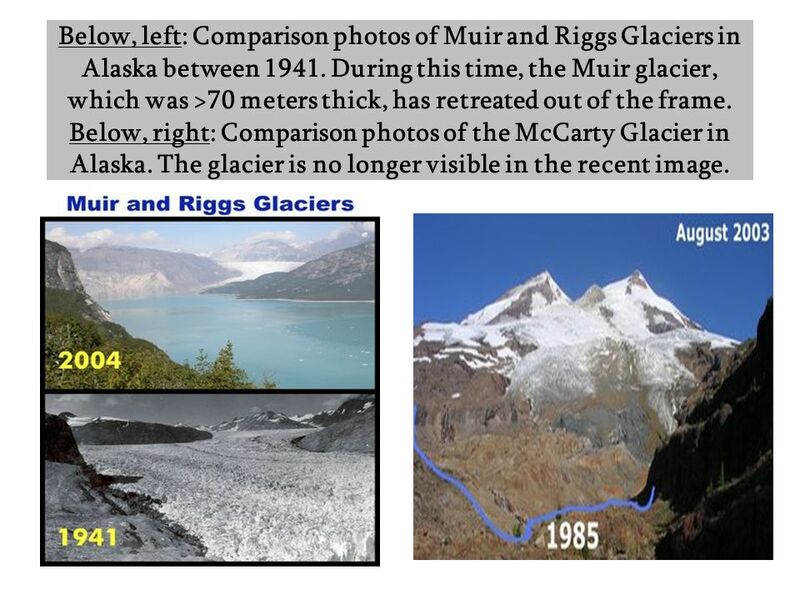 19 Below, left: Comparison photos of Muir and Riggs Glaciers in Alaska between During this time, the Muir glacier, which was >70 meters thick, has retreated out of the frame. 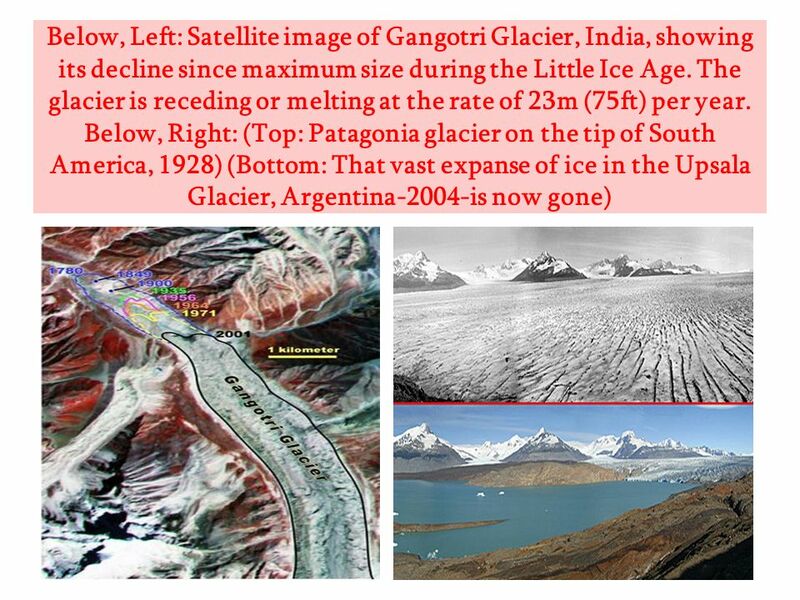 Below, right: Comparison photos of the McCarty Glacier in Alaska. 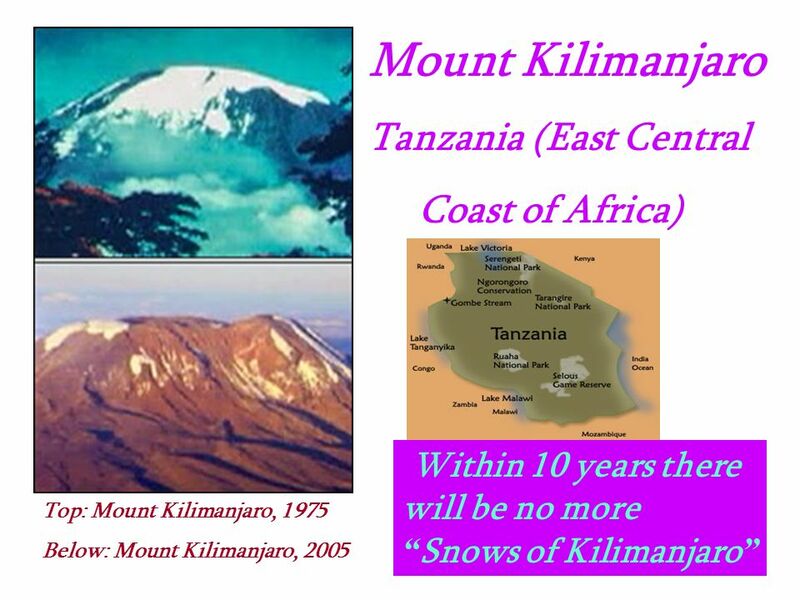 The glacier is no longer visible in the recent image. 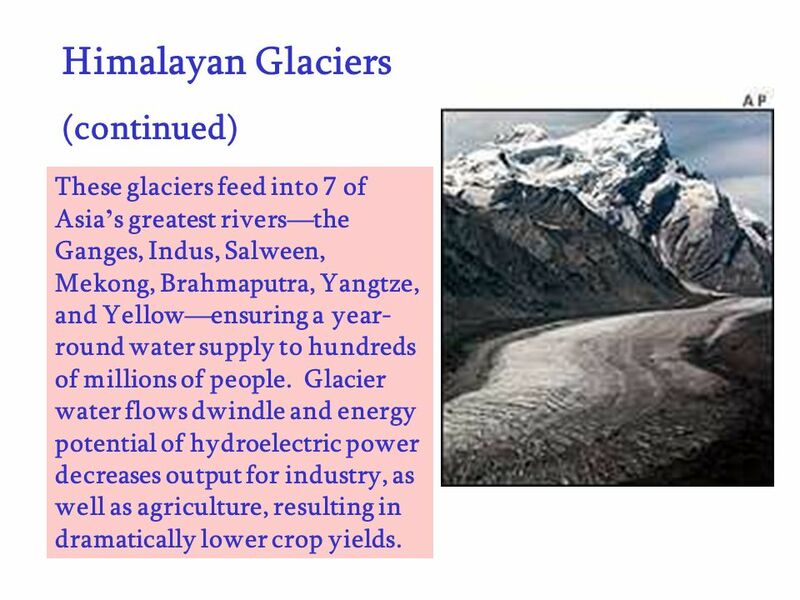 21 Himalayan Glaciers The rapid melting first increases the volume of water in rivers and causes widespread flooding; then in a few decades, the water levels of rivers decline significantly. 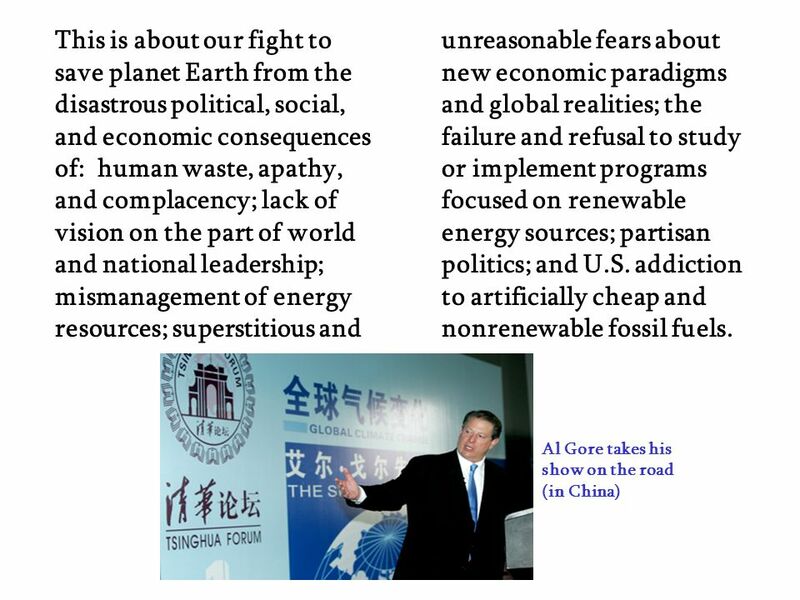 This means massive economic and environmental problems for people in western China, Nepal, and northern India. 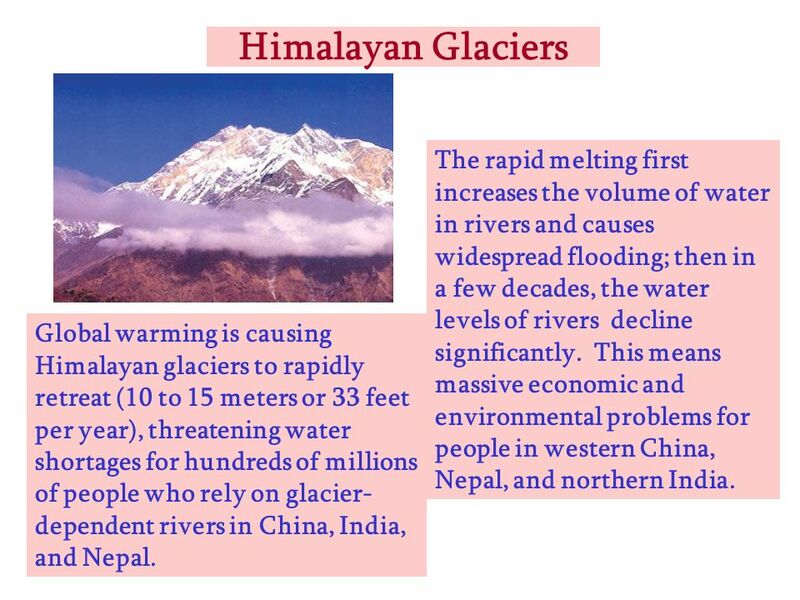 Global warming is causing Himalayan glaciers to rapidly retreat (10 to 15 meters or 33 feet per year), threatening water shortages for hundreds of millions of people who rely on glacier-dependent rivers in China, India, and Nepal. 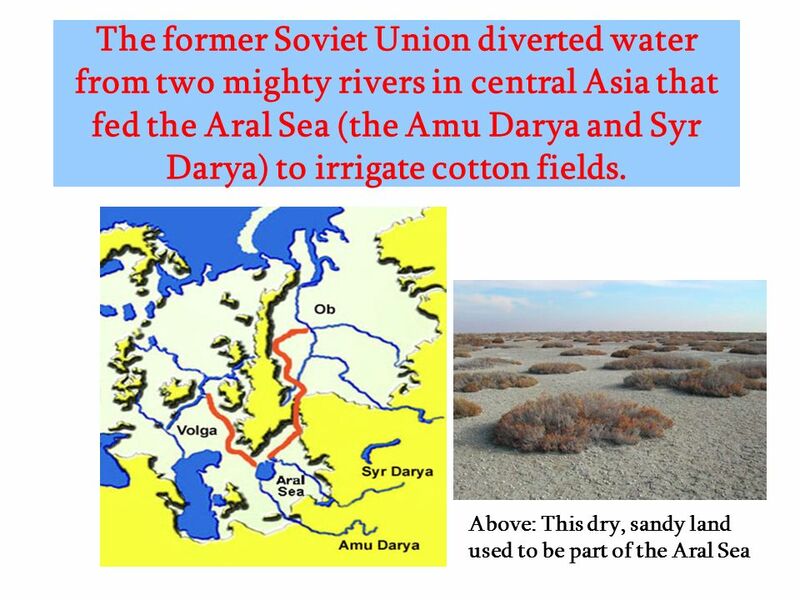 These glaciers feed into 7 of Asia’s greatest rivers—the Ganges, Indus, Salween, Mekong, Brahmaputra, Yangtze, and Yellow—ensuring a year-round water supply to hundreds of millions of people. 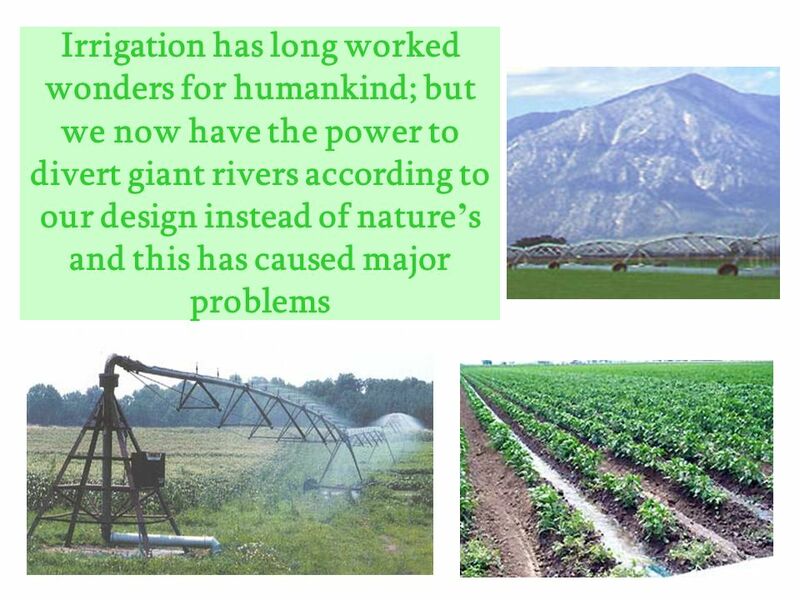 Glacier water flows dwindle and energy potential of hydroelectric power decreases output for industry, as well as agriculture, resulting in dramatically lower crop yields. 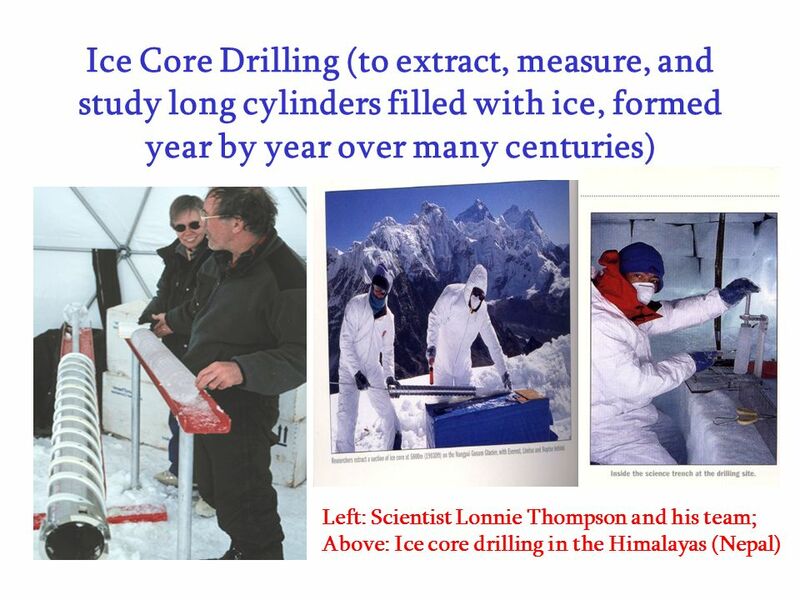 24 Ice core drilling has produced dramatic evidence of abrupt climate change. Researchers first became intrigued when they discovered striking evidence of large, abrupt, and widespread changes preserved in paleoclimatic archives—the history of Earth’s climate recorded in tree rings, ice cores, and sediments. 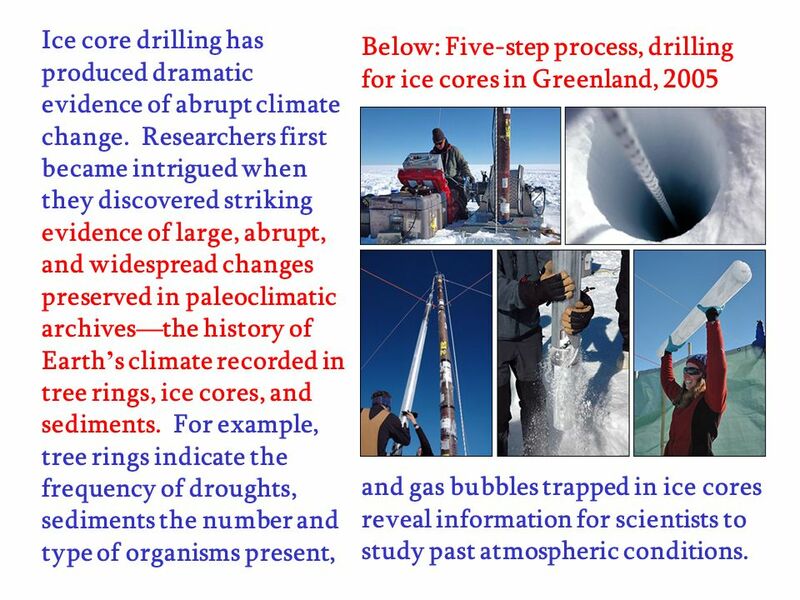 For example, tree rings indicate the frequency of droughts, sediments the number and type of organisms present, Below: Five-step process, drilling for ice cores in Greenland, 2005 and gas bubbles trapped in ice cores reveal information for scientists to study past atmospheric conditions. A polar bear walks across rocky ground near Wager Bay, Canada. Perhaps the Arctic’s most charismatic megafauna, polar bears face serious threats from global warming. The bears depend on sea ice as a platform from which they can hunt seals, their main prey. 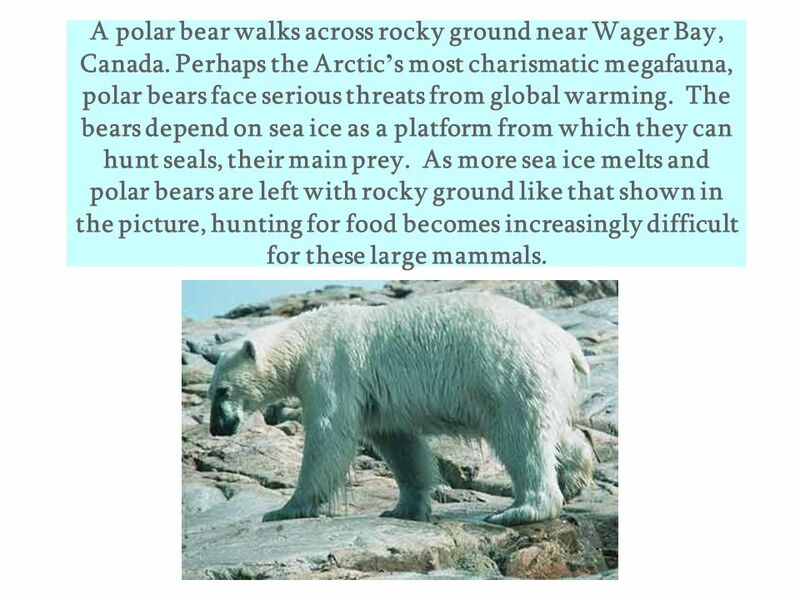 As more sea ice melts and polar bears are left with rocky ground like that shown in the picture, hunting for food becomes increasingly difficult for these large mammals. 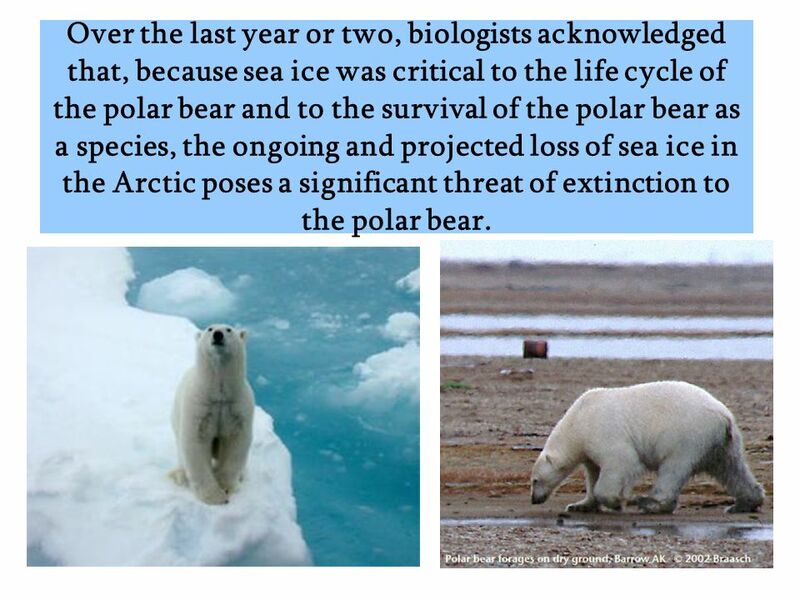 26 Over the last year or two, biologists acknowledged that, because sea ice was critical to the life cycle of the polar bear and to the survival of the polar bear as a species, the ongoing and projected loss of sea ice in the Arctic poses a significant threat of extinction to the polar bear. In the Arctic, evidence from satellite data, submarine data, and oceanic field observations reveal the diminished areal extent, shorter seasonal duration, and extensive thinning of sea ice. 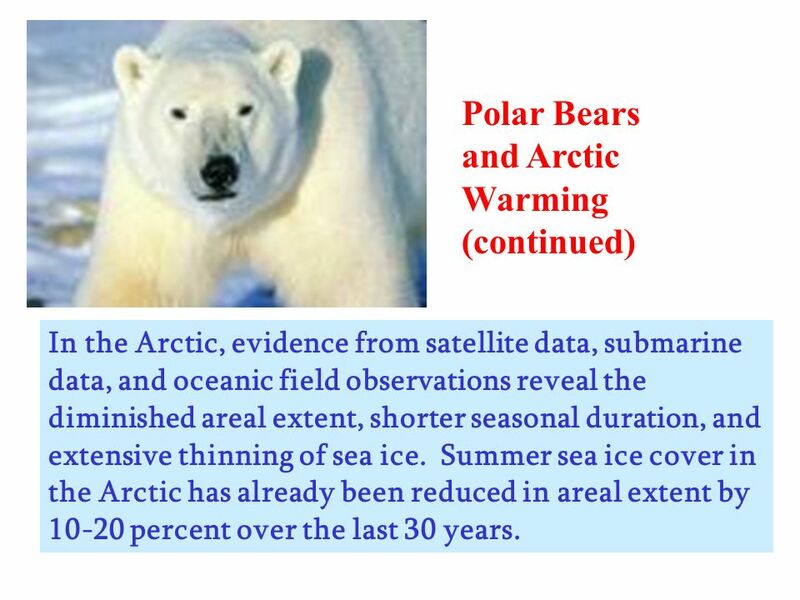 Summer sea ice cover in the Arctic has already been reduced in areal extent by percent over the last 30 years. 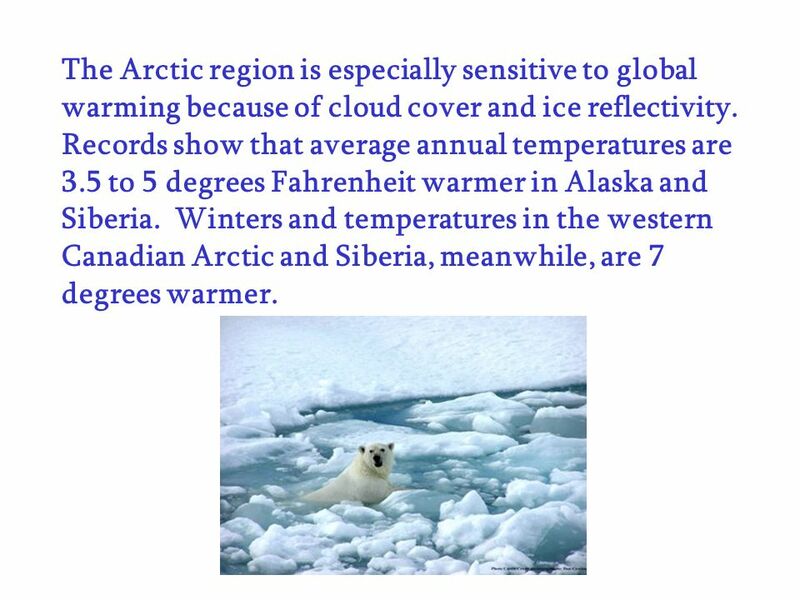 28 The Arctic region is especially sensitive to global warming because of cloud cover and ice reflectivity. Records show that average annual temperatures are 3.5 to 5 degrees Fahrenheit warmer in Alaska and Siberia. Winters and temperatures in the western Canadian Arctic and Siberia, meanwhile, are 7 degrees warmer. 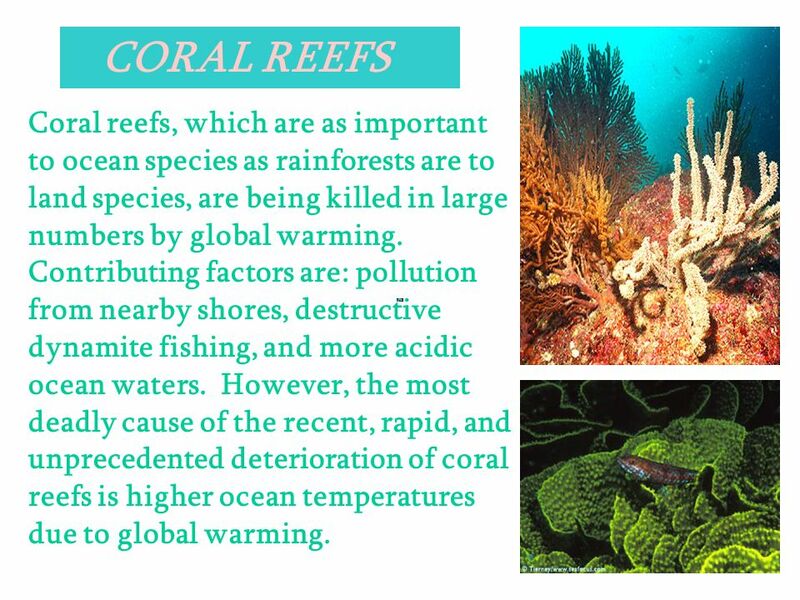 31 CORAL REEFS Coral reefs, which are as important to ocean species as rainforests are to land species, are being killed in large numbers by global warming. Contributing factors are: pollution from nearby shores, destructive dynamite fishing, and more acidic ocean waters. 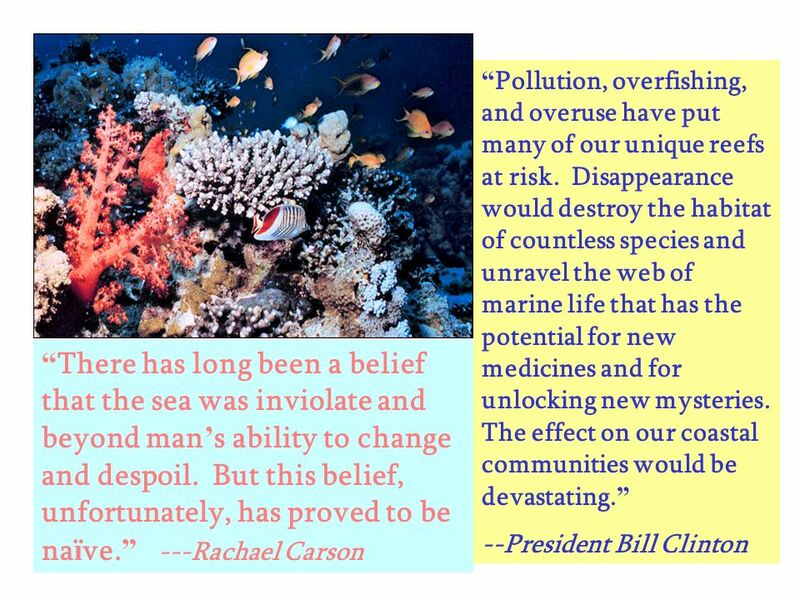 However, the most deadly cause of the recent, rapid, and unprecedented deterioration of coral reefs is higher ocean temperatures due to global warming. 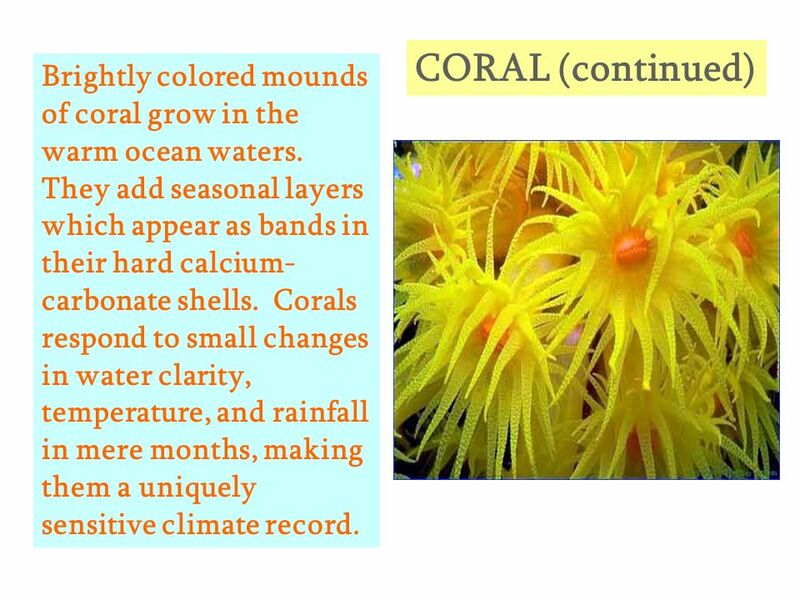 33 CORAL (continued) Brightly colored mounds of coral grow in the warm ocean waters. They add seasonal layers which appear as bands in their hard calcium-carbonate shells. Corals respond to small changes in water clarity, temperature, and rainfall in mere months, making them a uniquely sensitive climate record. 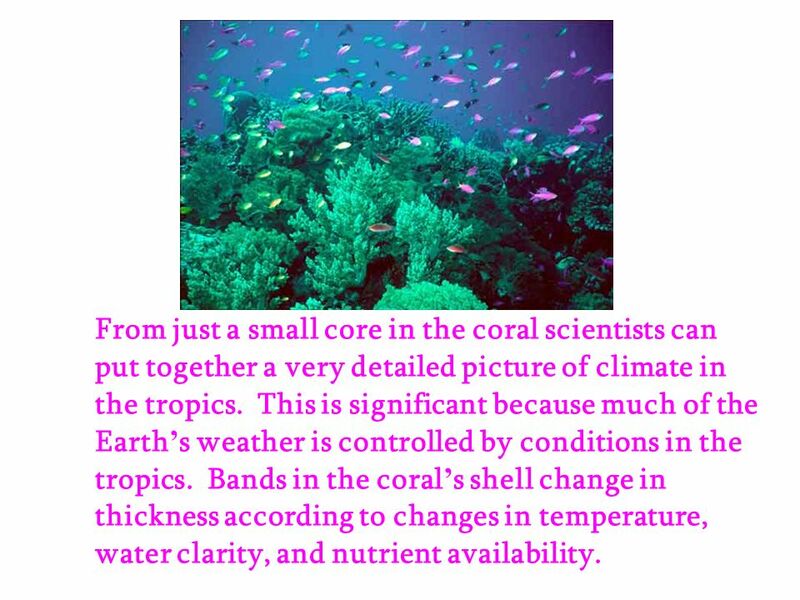 34 From just a small core in the coral scientists can put together a very detailed picture of climate in the tropics. 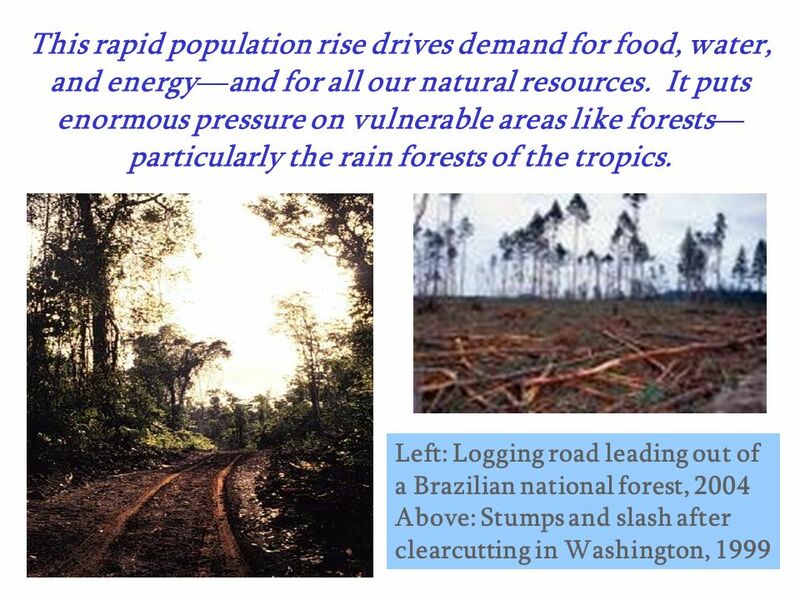 This is significant because much of the Earth’s weather is controlled by conditions in the tropics. Bands in the coral’s shell change in thickness according to changes in temperature, water clarity, and nutrient availability. 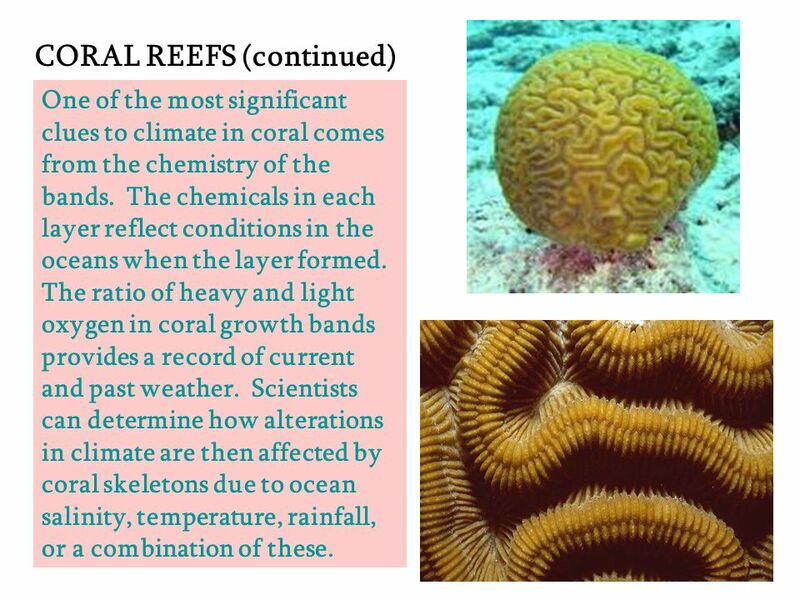 One of the most significant clues to climate in coral comes from the chemistry of the bands. The chemicals in each layer reflect conditions in the oceans when the layer formed. The ratio of heavy and light oxygen in coral growth bands provides a record of current and past weather. 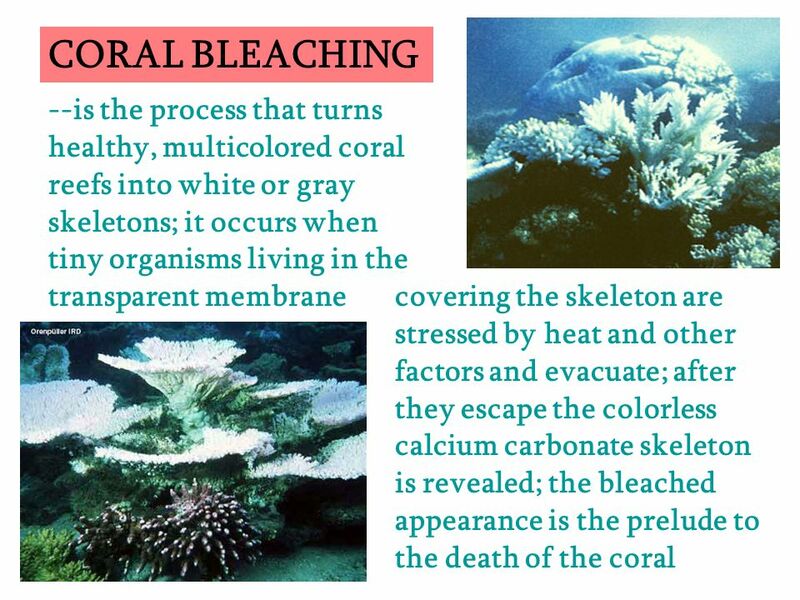 Scientists can determine how alterations in climate are then affected by coral skeletons due to ocean salinity, temperature, rainfall, or a combination of these. 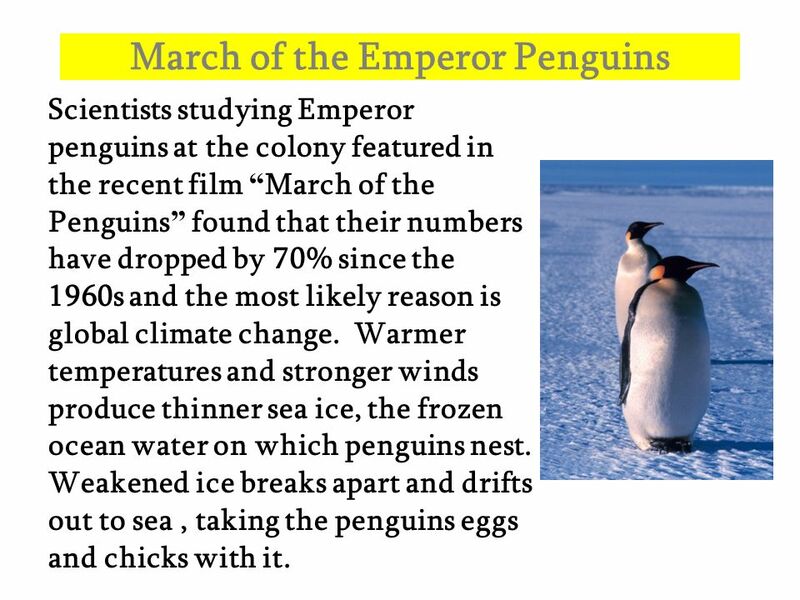 Scientists studying Emperor penguins at the colony featured in the recent film “March of the Penguins” found that their numbers have dropped by 70% since the 1960s and the most likely reason is global climate change. Warmer temperatures and stronger winds produce thinner sea ice, the frozen ocean water on which penguins nest. Weakened ice breaks apart and drifts out to sea , taking the penguins eggs and chicks with it. 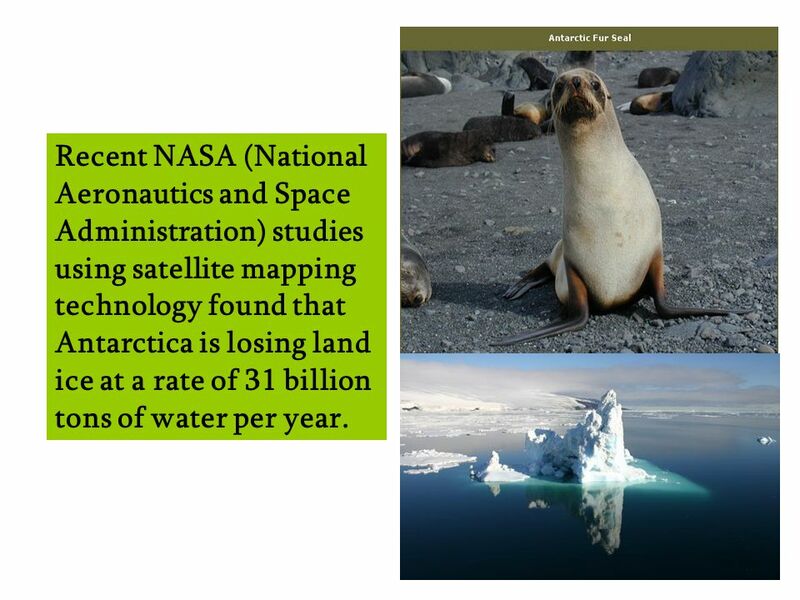 38 Recent NASA (National Aeronautics and Space Administration) studies using satellite mapping technology found that Antarctica is losing land ice at a rate of 31 billion tons of water per year. 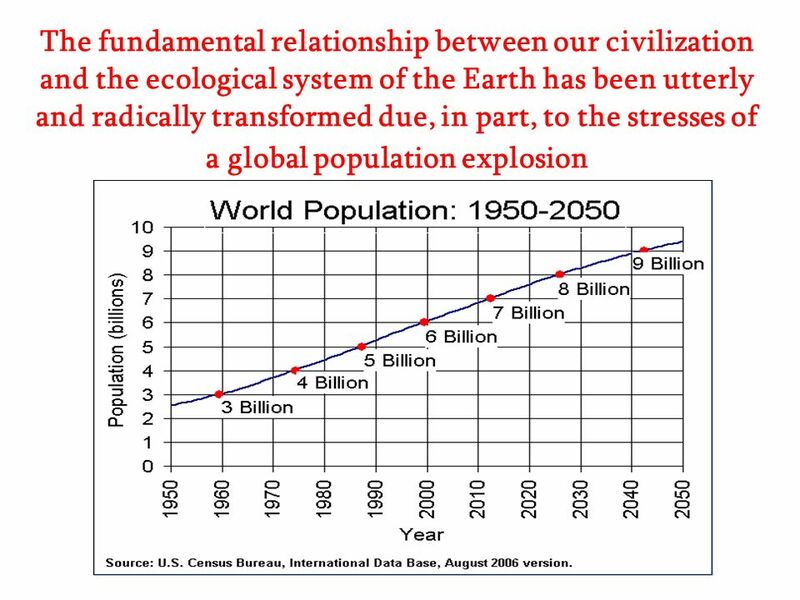 42 It took more than 10,000 generations for the human population to reach 2 billion. 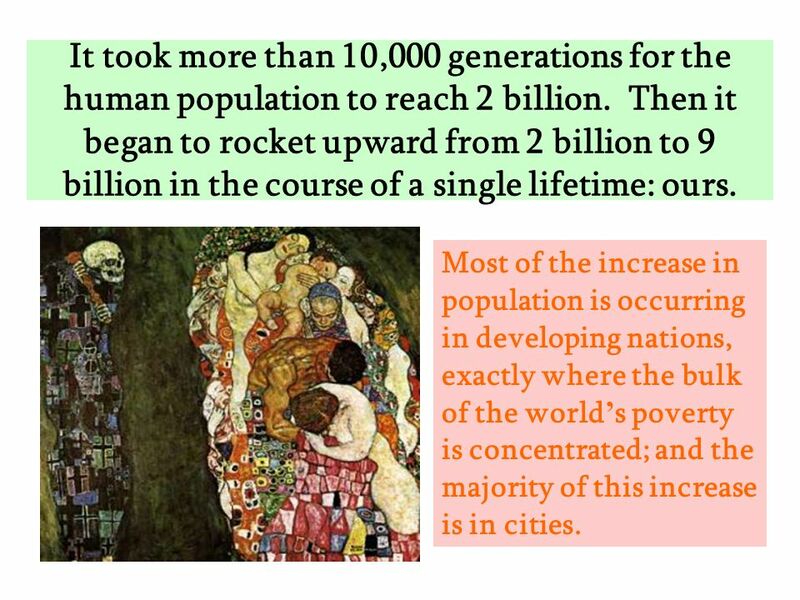 Then it began to rocket upward from 2 billion to 9 billion in the course of a single lifetime: ours. Most of the increase in population is occurring in developing nations, exactly where the bulk of the world’s poverty is concentrated; and the majority of this increase is in cities. An enormous fishing fleet marooned in the sand, with no water in sight. 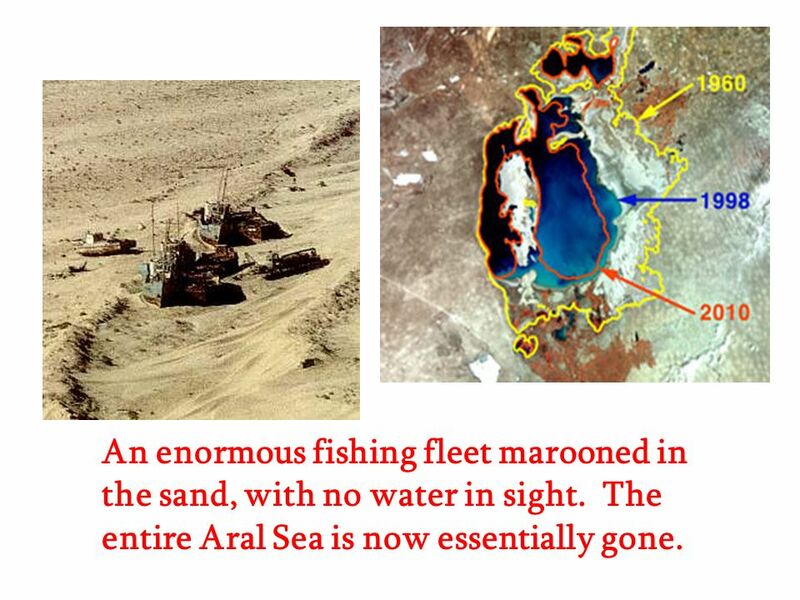 The entire Aral Sea is now essentially gone. 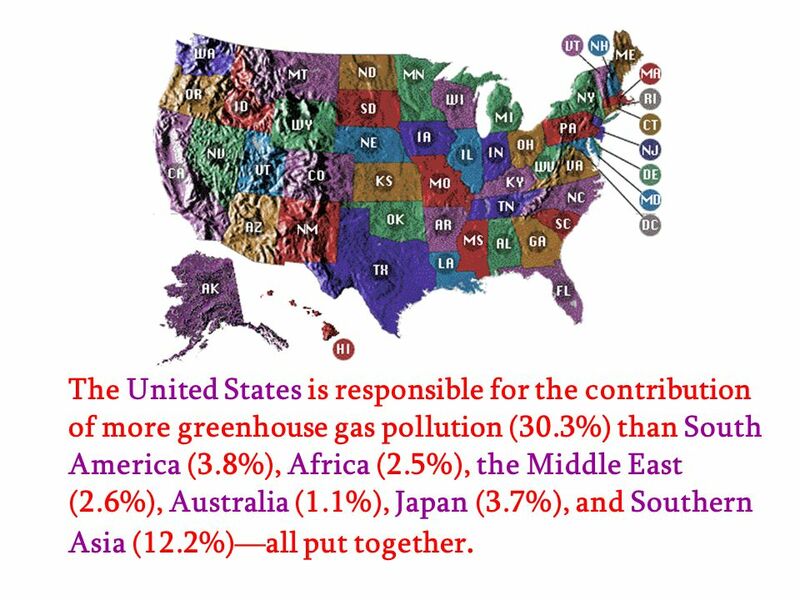 47 The United States is responsible for the contribution of more greenhouse gas pollution (30.3%) than South America (3.8%), Africa (2.5%), the Middle East (2.6%), Australia (1.1%), Japan (3.7%), and Southern Asia (12.2%)—all put together. 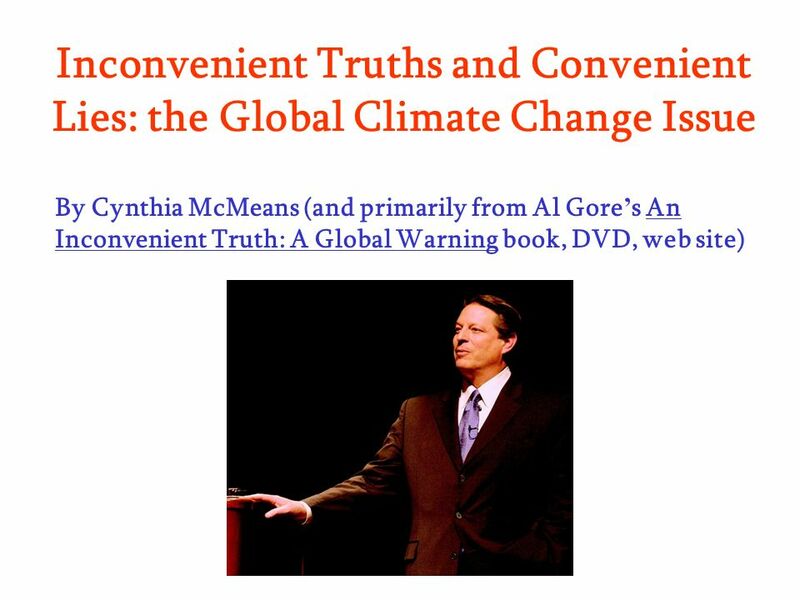 Download ppt "Inconvenient Truths and Convenient Lies: the Global Climate Change Issue By Cynthia McMeans (and primarily from Al Gore’s An Inconvenient Truth: A Global." 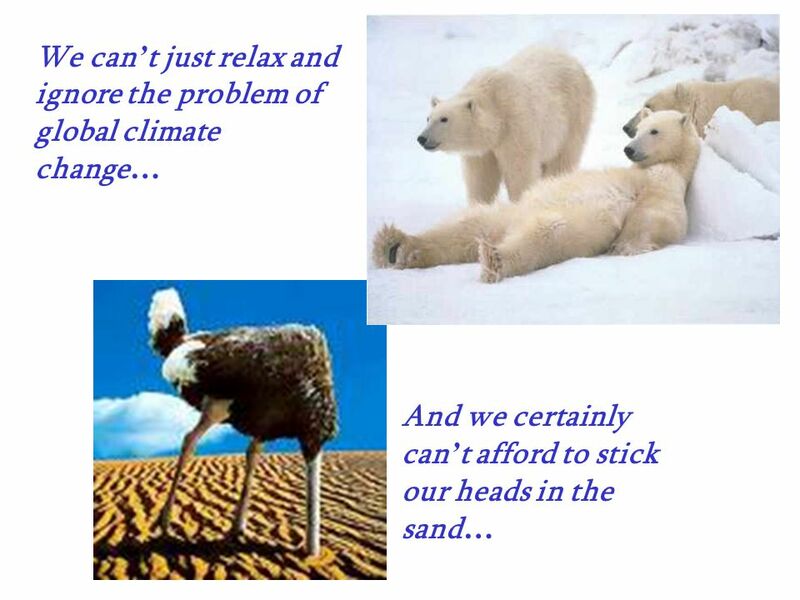 Climate Change An Inconvenient Truth. 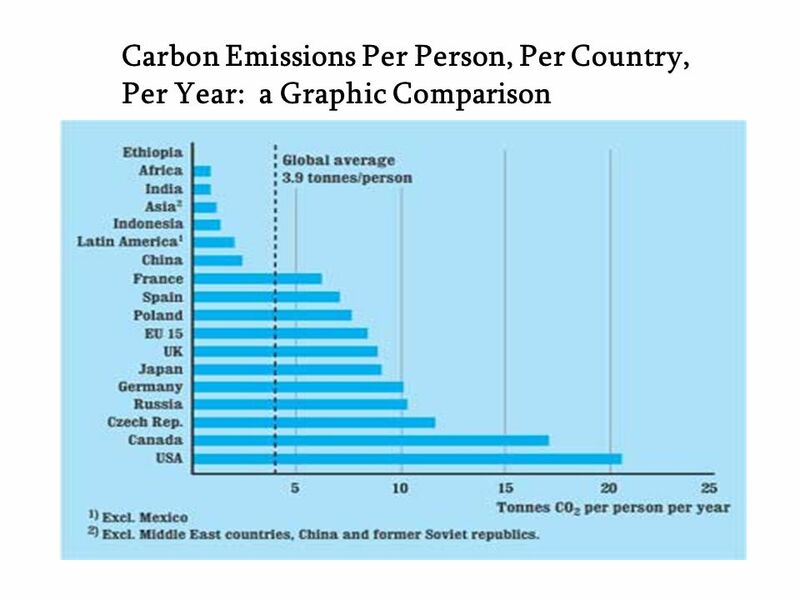 MAIN IDEAS 1.Human use of resources is releasing increasing amounts of CO 2 into the atmosphere. 2.This is leading. 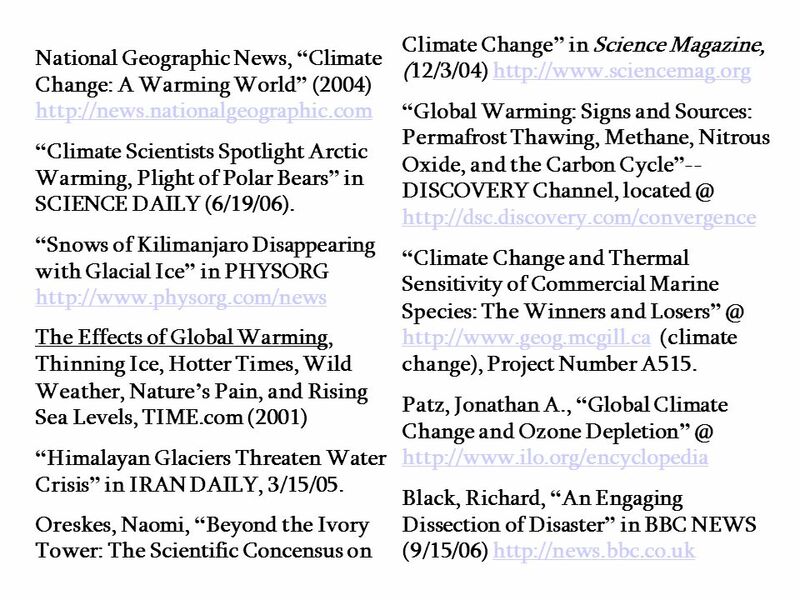 Global Warming and Climate Change SNC2D. 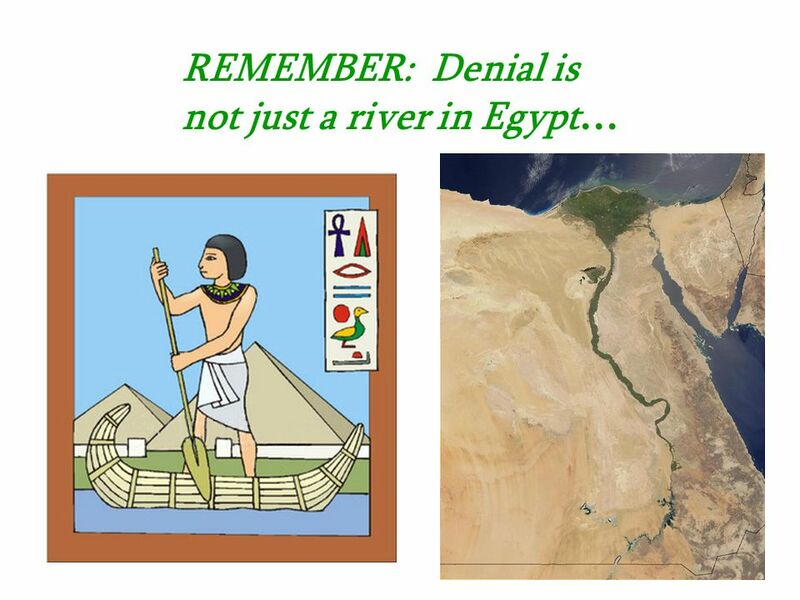 Truth The globe is warming. 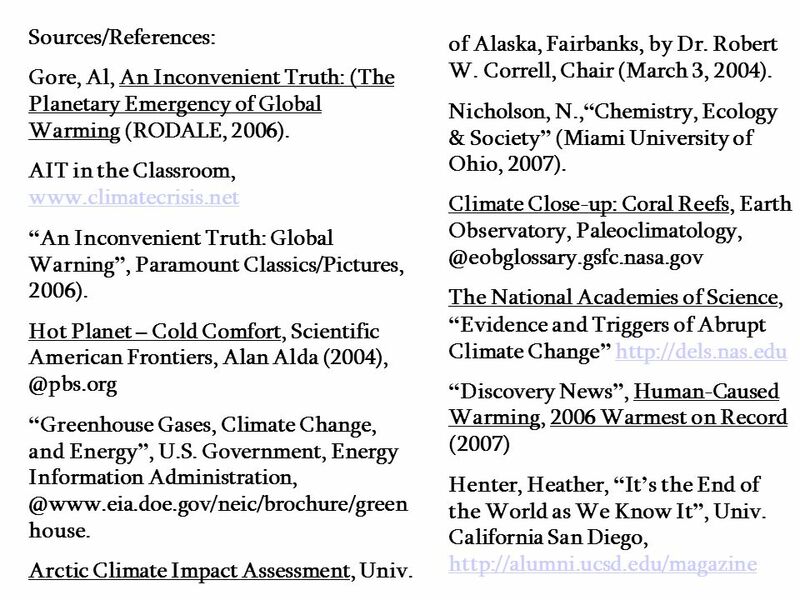 Heather Price, Ph.D Program on Climate Change University of Washington Global Climate Change. 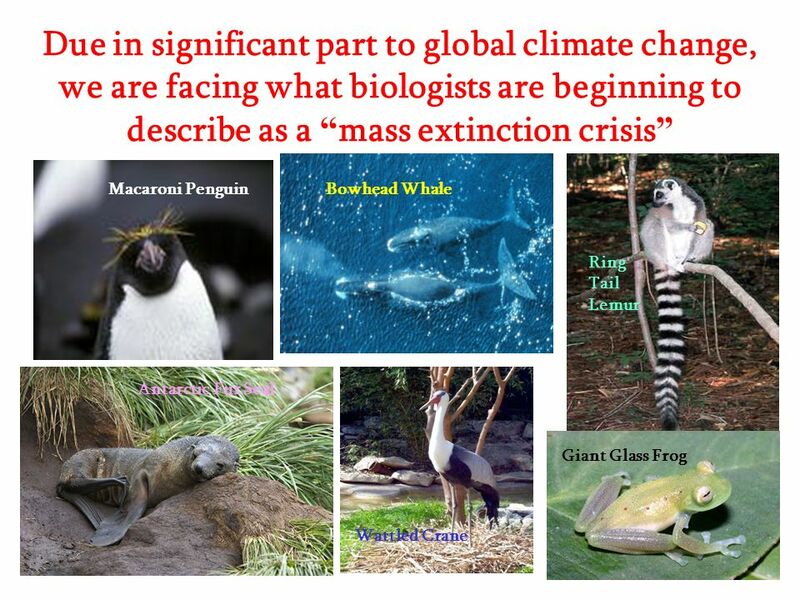 Class 14b: Global climate change Basics of global warming Potential effects Politics of global warming. Air Quality and Climate Change. Coal and Oil Formation Both are Fossil Fuels: remains of plants and animals that died anywhere from 400 million to 1 million. 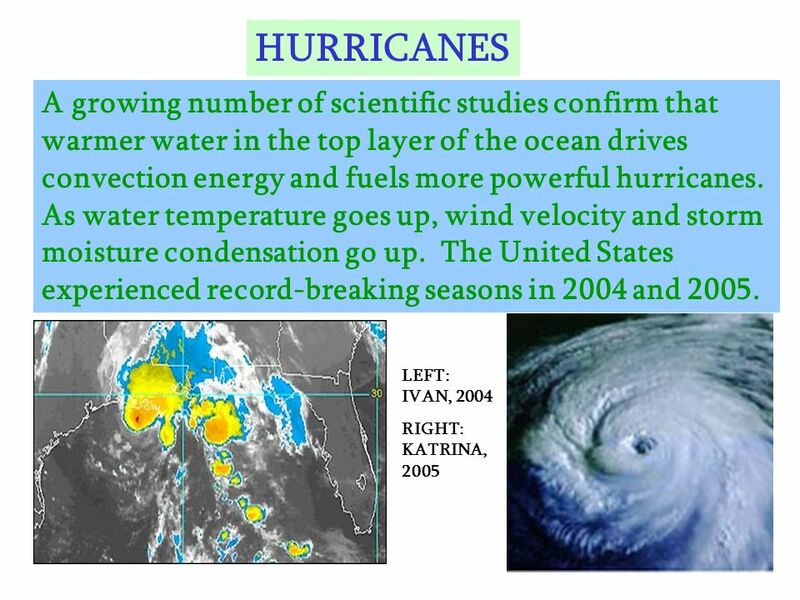 (events related to Earth science). 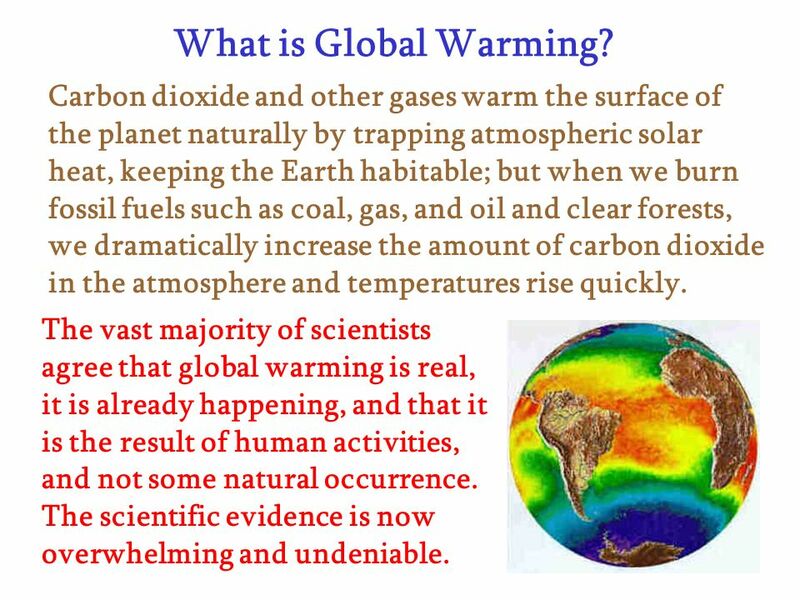 Global Warming Global Warming – is the increase of Earth’s average surface temperature due to effect of greenhouse.